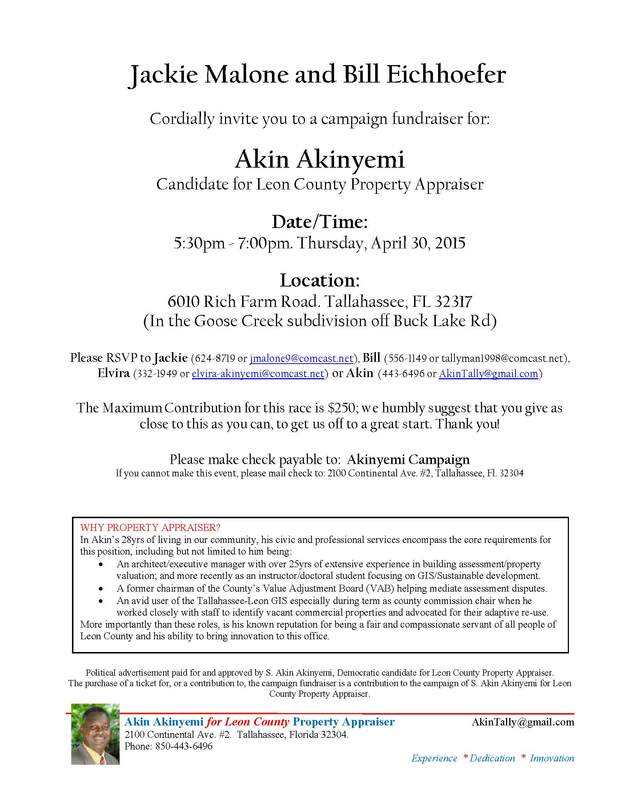 A fundraiser will be held for Leon County Property Appraiser Candidate Akin Akinyemi on Thursday, April 30, 2015, from 5:30 to 7:00pm. The event will be held at 6010 Rich Farm Road, Tallahassee, in the Goose Creek Subdivision off Buck Lake Road. The maximum contribution is $250. Please RSVP to Jackie (624-8719 or jmalone9@comcast.net), Bill (556-1149 or tallyman1998@comcast.net), Elvira (332-1949 or elvira-akinyemi@comcast.net) or Akin (443-6496 or AkinTally@gmail.com).